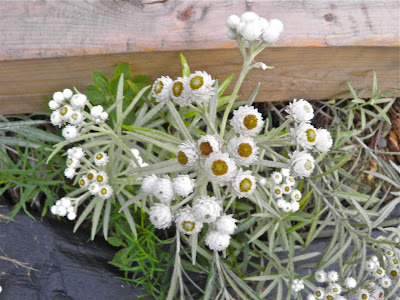 A clump of Pearly Everlasting growing between a piece of lumber and tar paper. Here’s a plant that is quite unassuming and common. I can state with near 100% certainty that every Nova Scotian has seen it. It is found along roadsides, both paved and gravel—pretty much anywhere that the growth around it is low enough for it to have a chance to thrive. 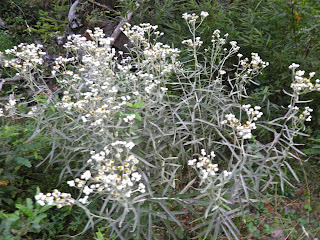 The plant is Pearly Everlasting. Anaphalis is part of a family of plants with around 110 species, the vast majority being native to Asia. There is one species native to North America that is fairly well known and quite popular in cultivation, namely the Western Pearly Everlasting (Anaphalis margaritacea). 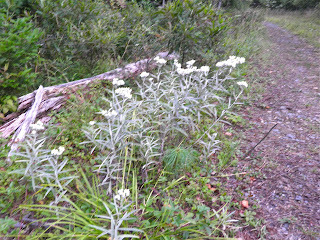 Growing alongside an old logging road. Our anaphalis has narrow, woolly grey-green leaves and papery white flowers with a yellow centre borne in clusters on tall stems. Each flower is just somewhat larger than 1/4 inch. The plants grow from underground runners and can spread to form dense clumps.The common name almost certainly comes from the unbelievable ease of drying the flowers for decoration through the winter months. Pearly Everlasting grows in height from 1-3 feet and can form dense clumps. It likes rich, well drained soil but if one sees it in the wild it doesn’t seem too picky about where it grows. It grows in USDA Zones 3-8 so is more than hardy in our region. 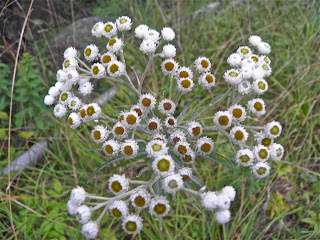 Pearly Everlasting likes to be kept moist but not wet and will droop (like any other plant) if left to dry too much. Pearly everlasting adds a wonderful grey foliage contrast to the green leaves of most plants in the garden. Since they bloom and last from August through to early October they are great companions with other fall blooming plants such as Anemones and Sedum. None of this is verified, so take it with a grain of salt… Anaphalis is supposedly expectorant, astringent, aromatic, anodyne, sedative, diaphoretic, vulnerary, pectoral, aphrodisiac and antiseptic. Externally, a poultice (warm, moist compress) has been used for sprains, bruises, boils, painful swellings and rheumatism. Poultices have also been applied to the head to induce relaxation and sleep. 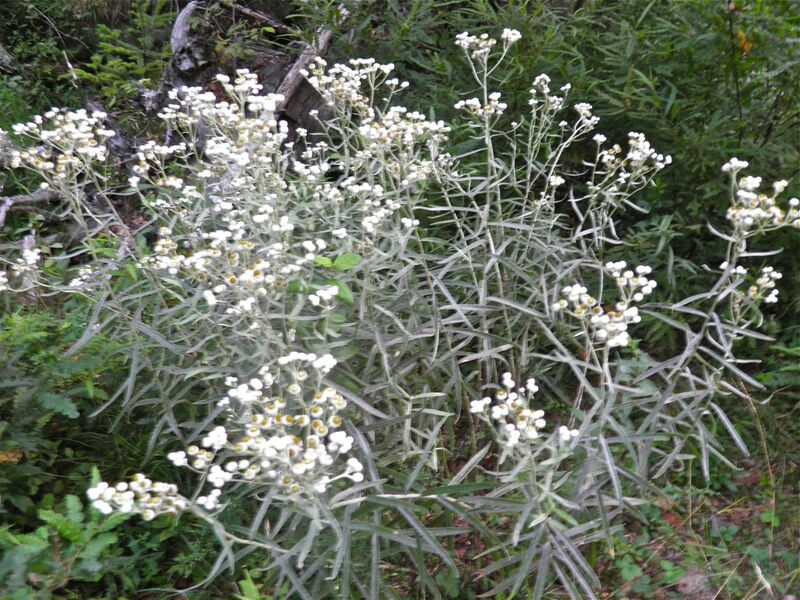 Many different Indian Nations used the plant for medicinal purposes. Some used the tea for colds, bronchial coughs and throat infections. Others boiled the flowers and applied them to burns and dermatitis.. Still others made an infusion of the flowers together with the root of mullein for asthma. Nothing could be easier than drying these flowers. I have done so two different ways. Simply pick and stick in a vase with a little water. As the water is used and evaporates the flowers will dry our standing in the position you arranged them. The second is to bundle, like herbs, and dry hanging inverted. Dried pearly everlasting will literally last for years. The flowers retain their whiteness when dried. A bunch can be a bit of a dust collector, but so are all dried flowers. I do not strictly follow feng shui, but here’s some thoughts for those of you who do. Feng Shui masters have a saying: "Trust what your heart is thinking." It is common thought that feng shui frowns on the use of dried flowers in the home as they do not have any inherent energy. Energy in material items is directly connected to the reason you have the possessions. So if you have positive connections (given by a friend, as a token of love, or happy memory) most certainly they are a good addition to the overall energy of your home. People have been drying plants and flowers since time immemorial for various purposes, both medicinal and culinary so the practice can’t be completely “bad.” For example, lavender is a great feng shui flower that has many uses in dried form (see my lavender liqueur for a fantastic one). The feng shui challenge with a dried flower is to keep it special, such as part of a special memory. Once the memory has passed or changed, get rid of it. That principle holds true for all things, and actually is wise to heed if you follow feng shui or not. I’m sure that a small (or large) bouquet of flowers won’t clutter up your life too much.